Lone Star Stories continues to be a magazine with consistent quality fiction and this issue doesn't deviate from that expectation. Unfortunately, the problem for me as a reviewer when it comes to such a magazine is that while the prose is good--certainly above mediocrity--finding the cream of the crop, the stories that eventually makes it to Best of the Year anthologies (or the reviewer own's list of striking fiction for the year), is an entirely different matter. I certainly enjoyed this month's line of stories and poetry but the quest goes on for finding a piece that burrows itself in memory. For example, I really liked the previous month's "The Toymaker's Grief" by Hal Duncan--easily one of the most remarkable stories for the year--and unfortunately that wasn't present in this issue. Having said that, here are the highlights. "Dream Seed" by Nina Kiriki Hoffman was pleasant enough. It follows a relatively consistent form and accessible language. The strength of the piece are the wonderful imagery that the author coaxes out of the reader. The transition of the speculative element in the story is also well-seeded and it doesn't detract from the story. Overall, the piece has a young adult vibe to it, from the sibling villain to the message at the end. I think as an adult, I've read enough stories like these and again, it was enjoyable but not particularly striking. "The Andrassil Agreement" by Stephanie Burgis is quite kinetic and dives into the action quickly. The author succeeds in juggling various characters and conflicts, keeping the reader's interest hooked. Easily the most mesmerizing story of the three but as far as emotional resonance goes, Burgis aims for a modest goal and succeeds on those terms. "Veronica" by Josh Rountree is the meatiest of the stories in this month's issue and the one I ended up liking the most. Rountree plays with a familiar concept and succeeds in evoking the proper characterization without being heavy-handed. For example, we catch a glimpse that the protagonist is old in body but young in spirit. There's also the use of various details that while not elaborated, gives us a sense of history and a bigger, wider world. What's intriguing for me is the use of the second-person by the author and in this context, it works and challenges me as a reader to wonder who this mysterious "you" is supposed to be. This is certainly an interesting story. When it comes to the poetry, "Speedometer" by Gemma Files is analogous to "Dream Seed": one is immediately immersed in the heart of the piece and its brevity matches the adrenaline. Probably great for the first few readings but after a while, those looking for more depth will want to check out the other poems. "All the Daughters of This House" by Nicole Kornher-Stace ended up being my favorite poem. It's divided into three sections and Kornher-Stace uses an uncommon perspective that gives the poem leverage to work fantastical stuff. Imagery and repetition is a strength of the poem but what won me over was the progression of the narrative and the language. "Damascus Divides the Lovers by Zero or The City Is Never Finished" by Amal El-Mohtar and Catherynne M. Valente is aptly titled and possesses a consistency that is nurtured throughout the entire poem. The form is certainly to be admired and combined with the text, highlights the central theme of the piece. Various imagery is also conjured and this is anything but a simple poem. Overall Lone Star Stories is another good issue and as far as the poetry is concerned, they're splendid. 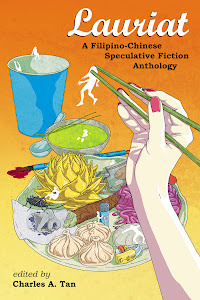 When it comes to the fiction, editor Eric T. Marin doesn't disappoint in selecting good stories (no horrible stories!) but I'm still waiting for that piece that knocks me out and declares itself as the unanimous winner.